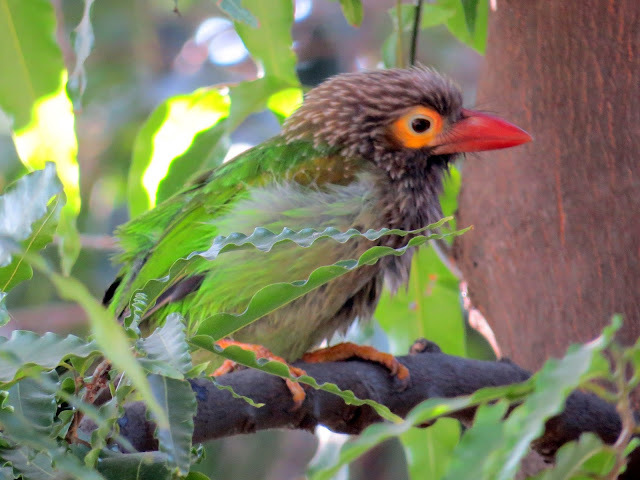 A Brown headed Barbet came to our bird bath today. We are journeying further into winters. The Sun is getting paler and weaker, softer and calmer. However, it does tend to gain strength by midday. This is the time when people in small hamlet like ours are through with the routine chores and come out of their rooms to get warmth of the Sun. This is post lunch session. Lazing around and reading a book, or eating oranges and nuts or just napping….it is absolute relaxation. 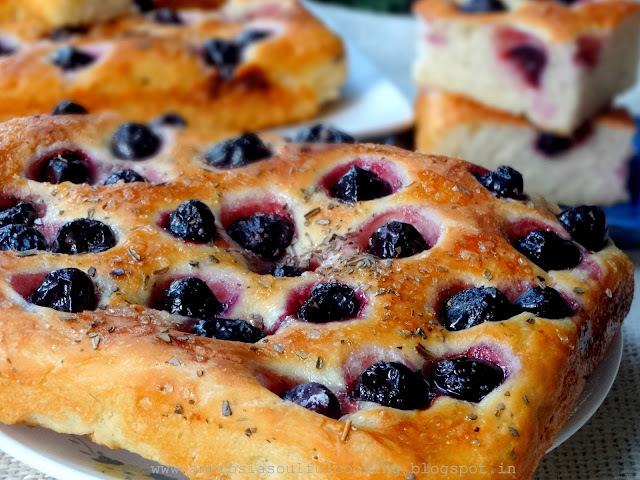 Having spent afternoon in the Sun, we decided on baking Focaccia with grapes- Schiacciata Con L’uva. Soon the pots and pans clanked as kids, decided to lend help in baking it. My daughter measured yeast and added it to sweetened warm water. Son washed and wiped the grapes dry, tossing a few in his mouth stealthily. Amidst animated conversation and excited chatter, the final dough was ready. Grapes were studded carefully, rosemary tossed, salt sprinkled and olive oil drizzled generously over the bread. Yeasty aroma wafted through and our bread was ready. In Tuscany, Schiacciata means “flattened down” and refers to flatbread that is otherwise known as Focaccia in Italy. 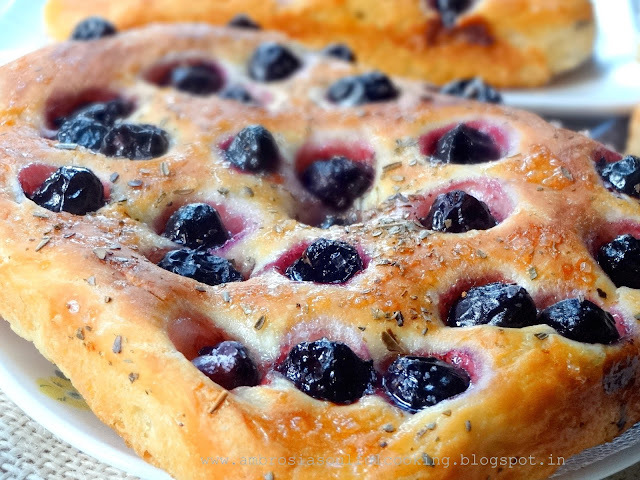 Tuscans make this lovely bread with grapes during grape wine harvest. 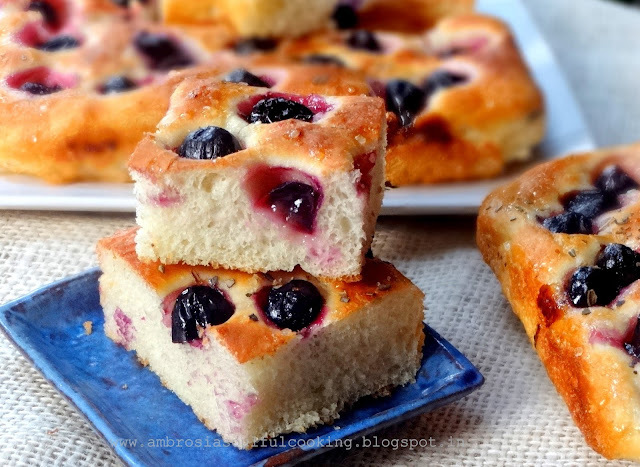 You’ll love this chewy, sweet-salty indulgence that has a unique taste of olive oil, grapes, rosemary all combined in every slice that has crisp edges and soft crumb. Mix water, sugar and milk. Add yeast. Let sit for 10 minutes till frothy. Add salt, flour and 2 tablespoons olive oil. Stir well and knead for 6 to 8 minutes till you get a very smooth and elastic dough. Transfer dough to an oiled bowl. Turn around dough so that it is evenly coated with oil. Cover with a kitchen cloth. Let is rise for 1 hour or until double. Press the down dough with oiled hand. Turn the dough onto a floured counter and divide into 2 balls. Let balls rest for 20 minutes. Brush two baking trays with oil. Apply oil in your hands and stretch balls one by one into a rectangle. Cover and let it rise for about 1 hour. Preheat oven to 220 degrees C. Brush the top of the Focaccia with remaining olive oil. Sprinkle the top with grapes, rosemary, salt and sugar. Bake for 15 minutes. The crust should turn golden. Cool on the rack. Slice and serve warm or cold. Lovely recipe and the addition of grapes is genius. Hello Gunjan, Thank you for your kind words. I am happy that you are also in Himalayan Foothills. Which part of the hills are you in?